Seattle, the largest city in Washington is one of America’s fastest growing cities which inspired many world-class brands, including Microsoft, Amazon, Starbucks and Boeing. This stunning city is set in the heart of the Pacific Northwest and is surrounded by plenty of natural beauty in the form of towering mountains, lush green forest and the Pacific Ocean. Seattle boasts an impressive skyline, thriving night scene, colourful cultures, distinct neighbourhoods, bustling shopping streets, delicious sea food and much more. The city is a haven for adventurers with plenty of outdoor activities, including fishing, hiking, skiing and canoeing. Seattle beams vibrancy and celebrates lots of cultural events all year round, dedicated to food, drink, art, film, music and more. It’s also an excellent art hub with a plethora of galleries and museums set across the city. The Seattle Art Museum is one of the finest art venues in the city, displaying both Pacific Northwest and Native American art. This museum also has an impressive outdoor sculpture park and a separate space displaying Asian art. Brightsun Travel offers cheap Seattle flights from India, allowing you to explore this diverse destination. Seattle is home to many amazing attractions including the Space Needle, which is the most iconic landmark of the city, standing at 605ft with an observation deck offering 360 degree views of the city’s skyline and surrounding mountains. Another notable attraction in Seattle is the Seattle Great Wheel, set on the waterfront with a 175ft observation wheel allowing panoramic city views. Pike Place Market is another must-visit attraction of Seattle; this old-style farmer’s market is the site of the first ever Starbucks, and is also home to stalls selling unique gifts, arts and crafts, fresh food, flowers and more. 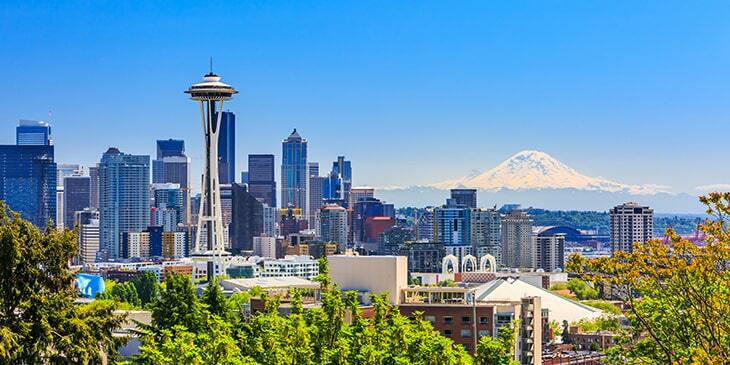 Seattle is a fantastic base for exploration of America’s beautiful attractions and landscapes. The Incredible Mt. Rainier National Park can be reached in less than two hours from Seattle, and circling this mountain is the Wonderland Trail which offers the most breath-taking vistas of snow-capped peaks, lush meadows and glaciers. Wine lovers can venture out to the charming suburb of Woodinville, set just 30 minutes from downtown and home to over 100 wineries featuring delicious local wines. Book cheap air tickets to Seattle with Brightsun and enjoy boundless adventures in this wonderful city.